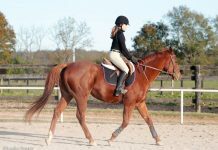 As in many horse-related activities, there are traditional approaches to breaking in a saddle as well as a little bit of new technology to help you along. You’ve pondered styles, researched suppliers, sat in seats, evaluated trees, though about girth lengths, decided on the perfect size for your horse and compared prices. Your catalogs are tabbed and dog-eared, and you’ve visited every tack shop you could find. And now the shiny, brand-new saddle is in your hands. You groom your horse immaculately, disdainfully bypass the old saddle and tack up with your prize. Hmm, it’s a little stiff tightening the girth. Up in the saddle, the blissful comfort you expected from your latest-design marvel is surprisingly absent. Your horse’s first steps are accompanied by a cacophony of squeaks and creaks. No, you haven’t made a big mistake. Your saddle is probably as much as you expected and more — it just isn’t broken in yet. How do you break a saddle in? 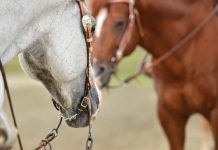 As in many horse-related activities, there are traditional approaches as well as a little bit of new technology to help you along. Although there are many viewpoints on how to break in a new saddle, two points of consensus are: use some kind of lubricating preparation to add moisture to the leather; and ride, ride and ride until the saddle fits your seat. Inside leather are bundle-like fibers that give it strength and flexibility. If those fibers get proper lubrication, they won’t squeak, dry out or split. Because leather is a natural substance, most who work with it recommend applying natural oils to replenish its moisture. Which products are best and worst for cleaning and lubrication leather is a topic of considerable debate. Glycerin has traditionally been used to clean leather surfaces and maintain shine, but it doesn’t penetrate the surface. Instead, it attracts moisture from the air to keep leather pliable. Another traditional product, neatsfoot oil, penetrates the leather but has some other drawbacks, some caused by its change in composition over the years. In the past, neatsfoot oil was actually made from boiled cattle hooves. Now products marketed as neatsfoot oils may be pork lard mixed with petroleum-based mineral oils. Neatsfoot and olive-based oils will permeate leather, but they continually migrate to the stitching and stress areas, eventually wearing off on your breeches or jeans. Neatsfoot doesn’t cause mold, but it does create an environment that can let mildew in. Also, neatsfoot oil may darken leather. Using highly alkaline products can weaken leather’s fibers. Saddle soaps were made for convenience centuries ago by mixing soaps with oils. The soap’s cleaning effectiveness, however, is diminished by its efforts to dissolve its own oils, leaving little useful cleaning capacity to remove dirty oils from the saddle. One-step cleaning/lubricating products are designed to be used occasionally when tack-cleaning time is tight. However, no one product can thoroughly clean and remove oils and then replace the moisture to lubricate the leather. Cleaning requires that dirt and soiled buildup be removed. Conditioning requires that oils lost in the cleaning process be replaced. Soap can also turn leather dark and remove tanning agents, causing hardening and cracking. To begin the break-in process, Frank R. Marciante, who makes Marciante Saddles in Paulden, Arizona, recommends using and good grain oil — extra-virgin olive oil or peanut oil, but cautions that mice like peanut oil. Commercial leather dressings, such as Hydrophane, are also designed for the leather’s initial oiling. For easier application, Marciante suggests pouring the oil in a can and painting it on with a brush. Wiping leather with a solution of bleach or vinegar was the traditional way to eliminate mildew, but that won’t prevent its return. “If you treat your leather like skin, keeping it nourished and clean, it will last longer than you will,” says Anna Blangiforti of Unicorn Editions, makers of Leather Therapy products, which contain mold and mildew preventives. It’s especially important to clean and condition the underside of panels and flaps that rub against the horse because his body oils and salty sweat can damage the saddle, she notes. Cleaning and conditioning products that are pH neutral will protect the leather’s fibers and stitching. Nontoxic additives prevent mold and mildew without detracting from other beneficial properties. Products with emulsifiers will also help push some built-up debris out of the pores of over-oiled saddles. Sue Littlefield of L7 Ranch in Simla, Colorado, prefers to use a leather cream, which she applies as soon as practical to a new saddle. “I have found that it does not darken the leather as much as neatsfoot oil. It also is less sticky than oil compounds. A used, soft toothbrush is great for getting the product down into the tooling.” A good rule of thumb is that if the brush scratches your skin, it’s too stiff for the leather. And, she reminds, rawhide should never be oiled. New English saddles often come with a white film of tallow, the natural fats and oils in the leather that have risen to the surface. “It’s a protectant and should be left on,” says Robin Davidson, saddle product manager at Miller’s Harness Company. As you ride, the heat and friction will rub the tallow back into the leather. Davidson recommends treating your new saddle with a leather conditioner called dubbin, such as Lederbalsam. Dubbin is a super-fatted emollient, a thick, pasty product that helps nourish the leather. “It is best to treat both the hair and flesh sides of the leather,” Davidson says. If the temperature is low, let the dubbin sit in the sun to warm up or it will be thick and difficult to rub in. Use a dry cloth or sponge, and rub on a light coating. After that layer has been absorbed, add another. A saddle that has been sitting on the showroom floor for months may need two or three coats applied a few hours apart. Then invest the time and ride in it, she says. Using a leather oil may break the saddle in more quickly because it penetrates quicker than dubbin, but it might penetrate to the core of the leather and release the dyes if it’s too saturated, she warns. Over-oiling can also cause dyes to stain breeches. “I’ve had many long discussions with the tanners and leather couriers we use, and they prefer the old English ways to make saddles and leather last a long time,” says Davidson. She cautions riders to never dip or soak their saddles in oil. Stirrups on a western saddle that hasn’t been broken in have a normal tendency t be parallel to the horse, when they need to be at right angles, says Burress. He soaks the saddle fenders, then rolls them back in toward the horse and ties them to dry, which sets the leathers so the foot will naturally slide into the stirrups. “When I store a saddle, I run a 2-by-4 through the stirrups to keep them turned in toward the horse,” says Burress. Once you’ve selected a lubricant and applied several coats to your new saddle, the next step is riding in it. But be sure that you’re just breaking in the saddle — not your body or your horse’s back — cautions Holly Covey of Mary-Dell Farm in Harrington, Delaware. The best way to break in a new saddle is to spend hours in it. Avoid using a heavy pad, ride for 20 to 30 minutes, then stop, get off, take the saddle off, and see if there are any hot spots on the horse’s back, says Covey. And while you’re riding, watch the horse’s ears and stay alert to see if there’s something bugging him. Those may be signs that the saddle doesn’t fit. Don’t expose your saddle to too much sunlight at first, because it has no natural oils, she cautions. Continually clean and oil it to work softness in. If you have a black saddle, be sure you don’t wear your best white breeches. The black will rub off, especially if you sweat a bit. Most leathers have dyes that are sweat-resistant, but save the white pants until the saddle is broken in. 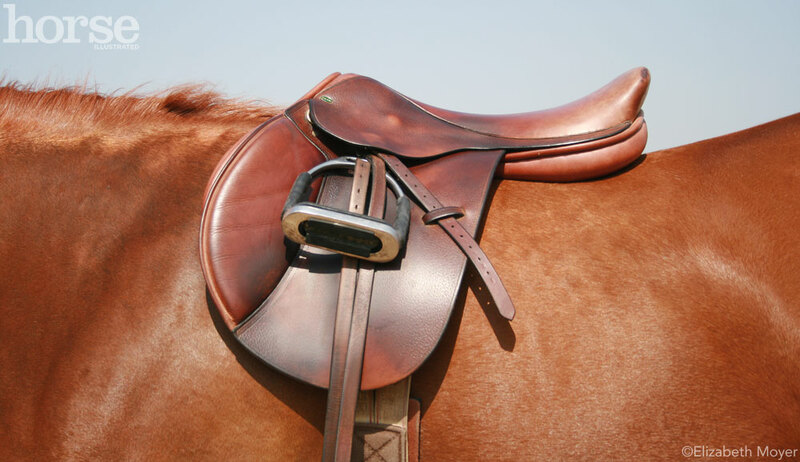 Although breaking in a saddle is somewhat of a “no-pain-no-gain” proposition, keep in mind that significant pain for you or your horse is a big hint that the saddle may not fit one or both of you. Keep your leather-lubricating product handy to use regularly and whenever your saddle gets wet. 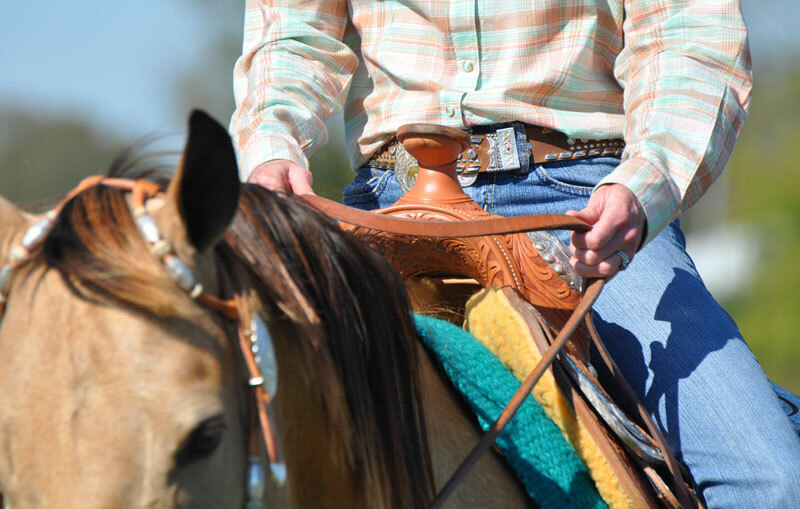 Your new saddle will soon be as comfortable as the old, and you’ll be ready for that show or trail ride. it really helps-for people with leather saddles! i have a synthetic saddle and its REALLY stiff i need help please!!! I’ve plenty experience riding but none with a new saddle. I now have 2 that I will be needing to break in for the coming riding season. I found the basics of what I need to do the job in this article and look forward riding my nice, new tack this Summer. good tips thanks! i just got a new saddle. you should add in that you should use stirrup leather covers if it’s a trial saddle. That way you don’t rub markings and ruin it because if it dose’nt fit you might not be allowed to return it. everything else is great i’m trying out this stuff on my new saddle. if you have a synithetic saddle it’s usually very stiff so a good idea is to buy a second hand one.but they don’t last as long i;ve had my experience.but lubricating a synithetic saddle will ruin it. so ride in at walk with your horse walk for about one week then trot for one week or even less if you want then do what you want. This was very helpful, but i was wondering if Lexol would work, or should i stick with an oil. Any comments?! thanks! ive been breaking horses and saddles for 45 years,quickest way to break in a saddle is to tie 20 ft of ropr arond the horn then throw it in the dam for 2 hrs pull it out strap it on your horse,go for a good ride,come back take it off and put it in a dry place for a week,then graese. Glycerine saddle soap all over. Get that dirt and sweat out and off of the piece. Wipe off excess foam from the soap. Allow to dry. Heat pure Neatsfoot oil or Neatsfoot compound in a small crappy sauce pan designated just for that service. I get it pretty hot, too – NOT blazing hot, just really, really warm. Don’t walk away from the stove, oil can catch on fire. Heating the oil is extremely efficacious; i.e. : it is much, much more effective than applying at room temperature. The hot oil is much more penetrating. I’m not kidding. I take a sponge – I prefer the dense kind that are made for grouting tile. I buy them from someplace like Home Depot and cut them into thirds (they work well for the Glycerine soaping, too). I take the heated oil and dip the sponge in it and liberally wipe it all over the saddle, underside, too, forcing it into the cracks and crevices. It soaks in very rapidly. After a short time, whatever is going to soak in will have soaked in. I take an old cotton T-shirt (cotton jersey – lint free) and wipe and buff all over the saddle or bridle. Leather is left preserved, soft, supple. You can wear heavy rubber cleaning gloves during the application if you don’t want to get the oil on your skin or the oil is too hot for you. I don’t bother with gloves. Oh, I’ve heard that some folks who use this method substitute a designated paint brush for application. • Pure Neatsfoot WILL darken the leather. So will the compound. Just sayin’. • Pure Neatsfoot can be kind of sticky. I have found that the compound is much less sticky. • I do not apply the Neatsfoot every single time I saddle soap the saddle. Depending on how much a saddle is used, I would say that I apply about every 2 to 3 months, more if the leather gets super wet during use. • I live in a humid climate (western Oregon). If a Neatsfoot leather item is stored in a barn or tack room for a length of time and it is not climate controlled, sometimes a funky layer of mold shows up. It’s of no consequence. I just saddle soap as usual, an apply the hot Neatsfoot, and presto: good as new. I think the mold appears because Neatsfoot is a natural fat or product. Some people hate Neatsfoot. I love the stuff and overwhelmingly the advantages outweigh the disadvantages. Try this method on one piece. See how you like it.